Home > Common Eye Conditions > What is Age Related Macular Degeneration? Most of us are likely to know someone, usually an older person, who has macular degeneration. The gradual, sometimes rapid loss of central vision caused by macular degeneration is devastating for anyone, especially people that have always been very active and independent. Around half of blind registrations by over 65s in Britain are due to age-related macular degeneration (AMD). Those at higher risk of AMD include the elderly, the long-sighted and those with a family history of the disease. Nutritional factors, exposure to ultraviolet light, smoking, and high blood pressure may also contribute. Macular degeneration is a condition that progressively destroys the eye’s macula - the area of the retina which produces the sharpest central vision. Although there are several forms of macular degeneration, by far the most common is AMD. Sometimes AMD develops so slowly (perhaps over decades) that the subject is unaware of visual change. At other times the effects can occur almost overnight. There are two types of AMD - "wet" AMD and "dry" AMD. There is no cure for AMD, and there is no treatment for the dry form, though treatments are available to arrest the wet form of the disease if it is diagnosed early enough. 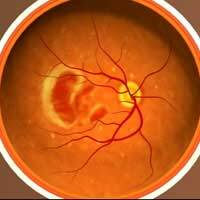 About 90% of cases of AMD occur as the dry form, where there is a breakdown of the retinal pigment epithelial cells in the macula. These cells are light sensitive and contain hundreds of tiny photoreceptors. Dry AMD is characterised by tiny yellow crystalline deposits known as drusen that develop within the macula. Drusen cause thinning and weakening of the macula. As well as reducing central vision, contrast and colour perception can be affected. Damage caused by dry AMD is not as severe or rapid as that of the wet form, but it can still cause serious loss of vision to develop over time. This is the most severe type of AMD. Although it occurs in about 10% of cases, wet AMD accounts for 90 percent of the severe vision loss caused by macular degeneration. The membrane underlying the retina thickens and eventually fractures. This causes interruption of the oxygen supply to the macula and the body responds by growing new, abnormal blood vessels. The blood vessels grow underneath the retina through the breaks in the underlying membrane in a tree-root-like pattern, often lifting the retina. The growing blood vessels often bleed and cause scarring of the macula, eventually irreparably destroying vision in the macula region. Although AMD rarely causes total blindness, the subject is left only with a small amount of peripheral vision. Since vision is then restricted to the “corner of the eye” it becomes extremely difficult, often impossible, to perform daily tasks such as driving, watching television and recognising faces and indeed to do anything that involves looking straight ahead. For information about how to treat AMD see Treating Age Related Macular Degeneration.